NEW YORK (Reuters) - Maziar Hashemi, a naturalized U.S. citizen who lives in Massachusetts, has been told by doctors that his best hope for surviving a rare form of blood cancer is a bone marrow transplant. President Donald Trump’s travel ban could make that impossible. Bone marrow transplants require a close match between donor and recipient. A few months after his diagnosis last September, Hashemi, 60, learned that his brother in Iran, Kamiar Hashemi, was a rare 100-percent match. The only problem was Kamiar’s nationality. The latest travel ban, issued as a presidential proclamation and implemented on December 8 after months of legal wrangling, bars most travelers to the United States from Iran, Libya, Syria, Yemen, Somalia, Chad and North Korea, as well as certain government officials from Venezuela. Although the ban allows for case-by-case waivers to be granted, including for medical need, Kamiar Hashemi has so far been denied a visa. Attorneys who regularly deal with visa issues say the waiver process is opaque. Visa applicants aren’t allowed to apply for waivers; they are simply granted or not without explanation. U.S. officials won’t say how they make their decisions or how long they generally take. A U.S. State Department official told Reuters that since the ban took effect, more than 375 waivers have been approved but he declined to say how many total visa applications have been filed from countries covered by the ban. He said he could not comment on the specifics of Hashemi’s case. 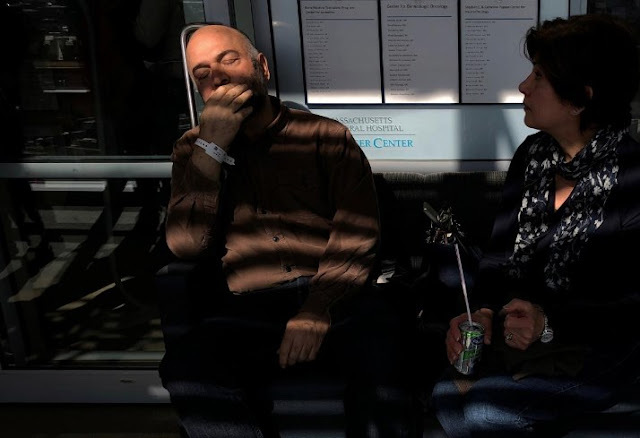 Patient Maziar Hashemi (L), who has the cancer Myelodysplastic syndrome, and his wife Fereshteh wait to meet with his transplant doctor at a hospital in Boston, Massachusetts, U.S., March 26, 2018. Kamiar Hashemi began the visa application process soon after learning he was a match for his brother. In February, the 57-year-old small business owner traveled to Armenia to be interviewed at the U.S. embassy there, since there is no embassy in Iran. Waivers can later be granted to applicants initially refused for visas, according to the State Department, so Maziar Hashemi continued checking the website each day, but his brother’s status hasn’t changed. He hired an immigration lawyer, Mahsa Khanbabai, hoping she might smooth the way. The Trump administration has said travel restrictions are needed to protect the United States from terrorism. Critics have challenged the latest ban, as they did previous versions, saying that it discriminates against Muslims. Six of the eight countries included in the current ban are majority Muslim. Under the current proclamation, waivers can be granted in cases where denying entry would cause undue hardship, when the individual is found not to be a threat and when their entry is in the national interest. The proclamation lists ten examples of situations in which an applicant might be eligible for a waiver. One reason mentioned is an applicant’s need for urgent medical care, something that comes close but doesn’t exactly fit the Hashemis’ situation, since it isn’t Kamiar Hashemi, himself, in urgent need. The State Department has declined to provide details of how waiver decisions are made beyond some general answers to frequently asked questions posted on its website. But a State Department letter obtained by Reuters earlier this month said “there is no waiver form to be completed” and that applicants who fall into the categories outlined in the proclamation “must be considered” for one. Nevertheless, Khanbabai submitted a packet of information on the Hashemis’ behalf to the embassy on March 19, including a letter from Massachusetts General Hospital explaining that a perfect match for a bone marrow transplant is very rare and could provide the only viable treatment for Maziar Hashemi’s Myelodysplastic syndrome. Worried about the ticking clock, Kamiar Hashemi looked into traveling to India to have his bone marrow harvested there and rushed to the United States, but that option was also thwarted. A non-profit organization trying to facilitate the transfer, Be The Match, said it had to pull out after its legal team concluded that Kamiar’s bone marrow couldn’t be exported to the United States because of U.S. sanctions on Iranian exports. “Can you imagine that the cells of an Iranian needed in order to help a U.S. citizen are embargoed?” said Maziar Hashemi, a civil engineer who has lived in the United States since the 1970s. 0 Response to "Trump's travel ban imperils U.S. citizen with cancer"